I’m slightly perplexed by this Blu-Ray disc. For one thing the recordings show their respective ages somewhat, both in terms of the sound and the camerawork – though oddly it’s the earlier of the two performances that comes off best from a technical stand point. Also Arthaus give prominence to the Weber Mass. While acknowledging that it’s something of a rarity, the Haydn Mass is superior both as music and as a performance and I’m surprised that didn’t receive top billing. Weber wrote this, the first of his three Masses, in 1818 for King Friedrich August I of Saxony. Quite how it became known as “Freischützmesse” is unclear as the Mass has no obvious connection with the opera Der Freischütz though Weber was composing the opera at the time he received the commission for the Mass. It’s scored for SATB soloists and chorus with orchestra. At times the music seems rather dull and dutiful. To be brutally honest, I was bored by quite a bit of it. The choral writing in particular is often unimaginative. The setting is redeemed by the prominent soprano solo part and fortunately in Krisztina Laki we have a very fine soloist. She’s prominent in the Kyrie and makes an immediately favourable impression. In the Gloria she has an important solo at ‘Qui tollis’, in which she’s poised and elegant. I also greatly enjoyed her rapturous solo in the Benedictus – in which she’s the only soloist involved. Unusually, Weber includes an ‘Offertorium’ movement after the Credo – the text begins ‘Gloria et honore cornasti eum’. This is for the soprano with support from the chorus and once again Krisztina Laki sings really well. The other three soloists have much less to do – when they sing in the Agnus Dei one almost has the impression that Weber suddenly remembered they are there. But what music they are given this particular trio sing well. The choral sound is somewhat woolly, which may be the fault of the recording since the orchestral sound isn’t outstanding either. However, as I’ve indicated already, the choral writing isn’t desperately inspiring. For example, the obligatory fugue towards the end of the Gloria lacks vigour and while that may partly reflect the way it’s performed here I don’t think Weber injected enough spirit into the writing. For me the acid test is whether or not I’d be keen to take part in a performance of this work and, frankly, the answer is no. 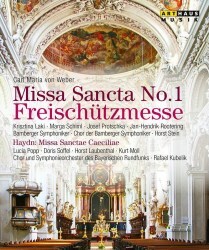 On the other hand, I’m pretty sure I’d enjoy singing in the chorus for Haydn’s Missa Sanctae Caeciliae. And lest it should be thought that I’m favouring Haydn’s setting over Weber’s because I know it better, that’s not actually the case: I know several of Haydn’s Masses quite well but not this one. It was written between 1766 and, probably, 1773 and it’s on a very substantial scale indeed. The Gloria alone lasts for just over 30 minutes in this performance and it’s somewhat surprising to find that the Credo, often the longest movement, is only just over half the length of the Gloria. I don’t think the musical invention is on quite the level of the ‘Nelson’ Mass but it puts Weber’s setting rather in the shade. It also receives a stronger performance. There’s an excellent solo quartet. It’s great to be reminded of the artistry of Lucia Popp, who is on fine form. Horst Laubenthal impresses too, not least in his extended solo at ‘Et incarnatus est’ in the Credo, which he sings with ringing tone and good expression. Doris Soffel and Kurt Moll make strong contributions also. The Bavarian Radio choir sings with commitment. It’s noticeable that in a couple of fugal sections – in Kyrie II and at ‘Et vitam venturi saeculi’ in the Credo – these passages have far more spirit than comparable segments of Weber’s Mass. Is that because Haydn’s music is more inspired or because a better choir is singing? I suspect that the answer is a bit of both. Rafael Kubelik inspires his forces in a way that I don’t really feel Horst Stein does and he gets some excellent playing from the Bavarian Radio orchestra. At the end of the performance there’s no applause from the very large audience but instead, rather charmingly, the bells of the church begin to ring and performers and audience stay put to listen. The presentation of this Blu-Ray is less than fully satisfactory. There’s no menu and I didn’t find it easy to navigate my way around the contents, especially to get from the Weber Mass to the Haydn. The sound and pictures are satisfactory if unspectacular – in the case of the Weber the recording is over thirty years old. In both cases the camera-work is rather unimaginative compared to what one expects nowadays; that’s particularly true of the Weber. Also the picture doesn’t fill the screen; one has a vertical black border on each side. To be honest, this isn’t a particularly compelling Blu-Ray issue, especially given the price premium for this format. If you’re going to invest, do so for the fine performance of the Haydn Mass.